James E. Tofflemire, Ent. proudly introduces the Sand Fox. This sled dog training cart has the same fine handling characteristics as our Sand Lynx, but it is designed to fold down for easy transport in a van, SUV, or pickup truck with a cab high canopy. The Sand Fox is designed with the urban musher in mind. This cart is 60 inches long, 40 inches wide and 18 inches high in the folded down position, so the Sand Fox can be easily transported and stored. Also, it only takes about 2 minutes to assemble. 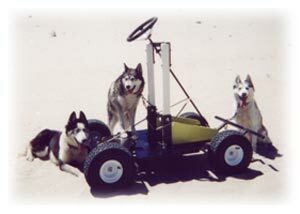 The Sand Fox has worked very well in field testing with 1 to 6 dogs. The Sand Fox will be available as a special order product, price $1089.00. If the Sand Fox fits your needs and your lifestyle, please contact us. The longer/ heavier Sand Lynx XL is now available by special order with this fold- down feature.